Last but not least in my series of September Sweaters is the green sweater for wee Bodhi. I originally thought I would knit trees (I mean, it’s a green sweater, it needs trees…obviously), but when I saw Emily’s swatch hat for Neve I thought to myself: snowflakes, it’s gotta be snowflakes! Neve’s hat was my inspiration! 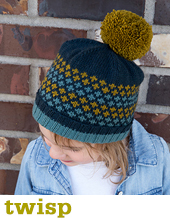 Check out the blog post with the chart for this hat here. When I made Hunter and Jones’ yokes I worked colourwork for the complete yoke depth, from just after the short row shaping all the way to the neckline. For Bodhi’s yoke I had a different approach – I wanted a single striking Fair Isle motif right in the middle of the yoke. I knit the sleeves and body per the Strange Brew pattern. 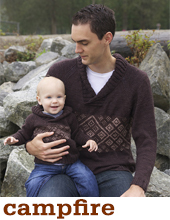 Once I had joined the yoke I worked short row shaping before the patterning, just like in the other 2 sweaters. I decided I didn’t want to incorporate my decreases into the chart itself. Instead, I worked 8 rounds in MC, worked my first decrease, worked my chart, then worked my second decreases, knit 7 rounds in MC, and my last decrease, then the ribbing. This made the ratios slightly different than in the pattern, but as we say, the numbers are squishy, and it worked out just fine! I didn’t want to do the snowflakes exactly the same as Emiy had for Neve’s hat so I tried a different style of snowflake with little cross motifs in between. I worked this 14-stitch repeat chart in the centre of the yoke; as luck would have it, after working decrease round A, the stitch count for the 6-8 year size is 168, which is 14 x 12, so no adjustment to the stitch count was necessary. There you have it, Bodhi’s simple snowflake sweater. So, now that this year’s epic September sweater photoshoot is done, it’s time to start plotting for next year! Maybe a series of cabled sweaters? Perhaps it is the year of Gramps sweaters? Bumble? More Fair Isle? Decisions, decisions…..
Do you have any epic knitting traditions? You are amazing! Your knits are absolute works of art! !